The Netherlands have a social security system that is being used to help individuals and families, who find themselves in a challenging financial position. This includes people who receive insufficient income (permanently and temporarily) due to unemployment, a disability, disease or pension. The system also features other supporting policies, such as care and guidance in case of disease, a disability or when unfit for work. In short, the social system in the Netherlands provides appropriate financial support when the (personal of family) situation requires it. Social security in the Netherlands is based on solidarity and fraternity. All citizens are collectively supported, and people with a high income pay a larger contribution to the system than people with lower salaries. 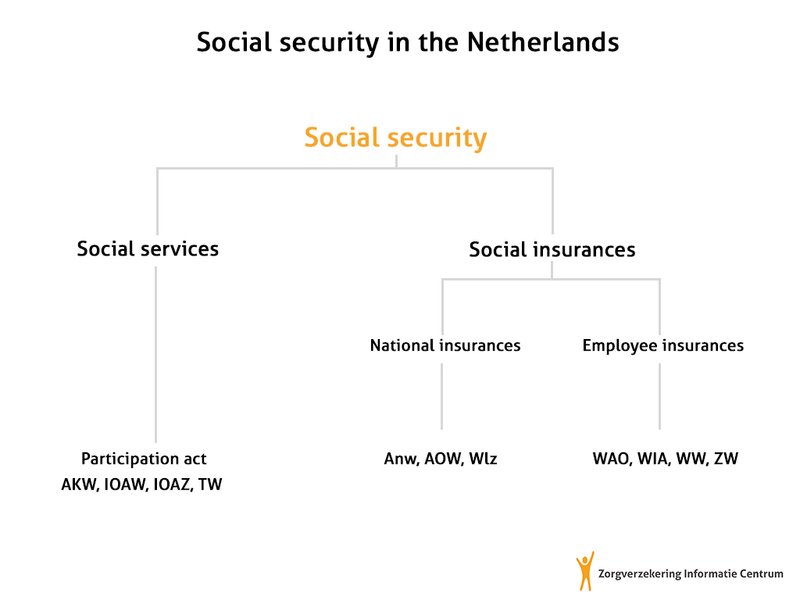 The social security system in the Netherlands consists of social services and social insurances. Social insurances can be subdivided into national insurances and employee insurances. The main difference lies in the fact that social services are financed by the state through taxes, while people are obliged to pay a premium for national insurance. National insurances are paid by income-related premiums and insurances. Employee insurances on the other hand are paid by an income-related premium for employees. The Dutch social security system is visualized in the image below. After that, all social services and insurances will be briefly discussed. Social Services can include payments or other forms of support that are being financed by the government through taxes. The Participation Act, previously known as the ‘Work and Social Assistance Act’ (WWB), is an act that supports people who are capable of working, but who experience difficulties at finding work or executing work activities. This can be caused by a physical or mental disability, which results in a working disability. The Participation Act has the necessary tools to make sure that these people will also be able to contribute to the job market. The Participation Act also takes care of financial support for people who have no means or insufficient income to provide in their livelihood and who do not qualify for other social benefits. The IOAW act (Older and Partially Disabled Unemployed Workers Income Scheme Act) is an income service for the elderly (born before 1965) who have become unemployed. In case of sufficient employment history, they can apply for a IOAW-benefit as soon as the unemployment benefits end. The IOAW-benefits complement the level of income to that of social benefits. These benefits are not affected by any other form of capital. The IOAZ act (Older and Partially Disabled Former Self-Employed Persons Income Scheme Act) is meant to financially support older single-households with insufficient income, due to unemployment or a disability. This is done through the IOAZ-benefits, which can be requested at the municipality desk. The Supplementary Benefits Act (TW) is meant to support the income of people who receive social benefits from the UWV, because of long-term illness, unemployment, a disability or an income that is below the social minimum. The General Child Benefit Act (AKW) is meant to serve as a social benefit for the costs of childcare. The benefits apply to parents who attend school, are unemployed or unfit for work. The AKW is executed by the Social Insurance Bank (SVB). Lastly, there are national insurances. These insurances apply to everyone who lives or works in the Netherlands. These insurances are paid from income-related premiums and taxes. A large part of Dutch health insurance is financed through this arrangement. The Chronic Care Act (Wlz) is meant for people who are in need of intensive healthcare, such as people with a chronic disease or disability and vulnerable elderly. This includes staying in a facility, guidance, nursing, care and medical devices, but also medical care and treatment. The Medical Needs Assessment Centre (CIZ) is responsible for the execution of the Wlz. The Dutch Healthcare Insurance Act (Zvw) requires every individual to take out a basic health insurance, starting from the age of 18. The new healthcare insurance act of 2015 contains a few new elements. For instance, people who need nursing and care at home can now apply for district nursing via the Zvw. The government aims to achieve more independence and participation with this new arrangement. The goal is to lower the amount of people who are usually transferred to a nursing home. Since the 1st of January 2015, municipalities have been co-responsible for providing care facilities for their inhabitants. By offering supporting facilities, municipalities try to stimulate the independance and participation of its citizens. People who require specific care or support can make a request at the municipality for a service or facility, such as a wheelchair. The main idea behind the Wmo is that municipalities can better anticipate the needs of their inhabitants. In other words, they can deliver a service that is tailored to the needs of their target group. The State Old Age Pension Rights (AOW) take care of the mandatory minimum pension for elderly who have reached the eligible AOW age. The premium for this national insurance is collected through income taxes. The SVB facilitates the payment of the AOW to the insured. People are entitled to an allowance after their partner passes away, through the Surviving Dependants Act (Anw). The sudden loss of a partner can also mean a big loss in one’s income. In that case, the Anw takes care of proper financial support for the bereaved. Employees insurances are, as the name indicates, meant for employees. These insurances are an important part of the social security network. Employees insurance is usually paid for by the employer, who deducts the premium from the employee’s income. The Work and Income (Capacity for Work) Act states that people, who have become partially or fully disabled, are entitled to an allowance. This allowance starts after the lawful wage payment term of two years. The WIA is meant to be the successor of the WAO. However, the WAO continues to exist for people who became unfit for work before the 1st of january 2004. Both laws are being executed by the UWV. The Invalidity Insurance Act (WAO) can be compared to the WIA. The law is meant for employees who have become unfit for work because of illness or a disability. They receive an allowance, so they can continue to provide for their household. The Unemployment Insurance Act (WW) is meant for employees who lose or quit their work. The amount, as well as the duration, depends on a large number of factors, including the WW monthly income and the total amount of working years. The UVW handles the applications for a WW-allowance. The Illness Benefit Act (ZW) states that ill employees, who do not receive any pay during their illness, are entitled to an allowance. Also those who no longer have an employer (for instance: because of unemployment) can apply for an allowance based on the Illness Benefit Act. Similar to other employee insurances, the request for an illness benefit allowance is handled by the UWV.